In the rapidly expanding, kaleidoscopic world of ecommerce content marketing, there will always be some concepts that stand the test of time. We believe the humble gift guide is one of them. What started out as a semi-precious, tangible object (with real pages) has quickly evolved into an online marketing staple: something that can be perused at any time, in any place, on any device. Which is why, if your brand does have a digital edition of your gift guide, it’s always worth shouting about. After all, consumers won't proactively search for your guide, so it’s up to you to get it noticed. For this blog post, we’ve taken a look at the way in which eight savvy brands are doing just that this Christmas. 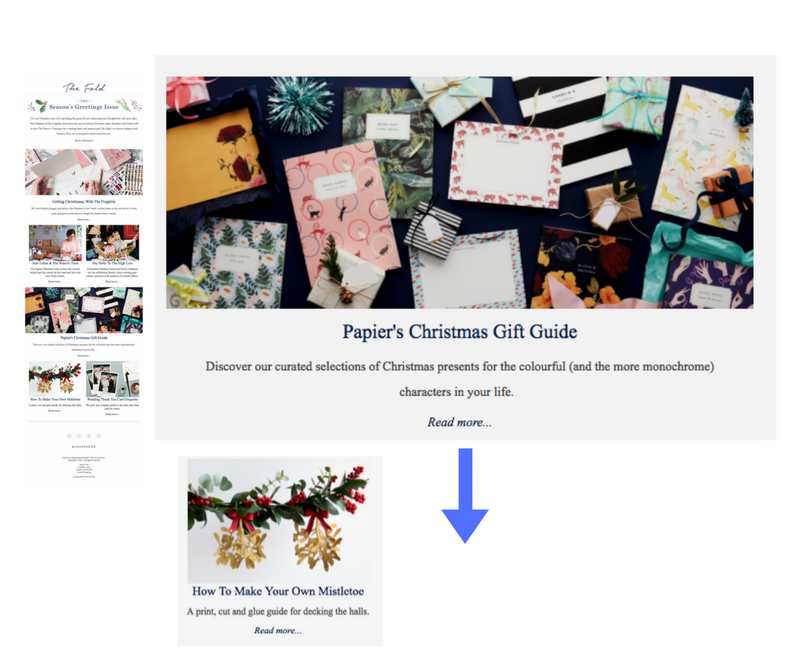 From email marketing to social media to on-site content, for each example we’ve included an image of the gift guide promotion in question, followed by a snapshot of the guide that appears once it’s been clicked. The message: By pairing the gift guide with an email about delivery dates, recipients are more likely to feel compelled to have a browse through what’s on offer in the guide this Christmas so they can make any last minute purchases. The copy: From the get-go, the copy of this email is powerful: kicking off with the pun-tastic title of the guide (“present and correct”) before moving onto a colourful and evocative description of what recipients can expect from it. Verbs such as “help”, “plan” and “thank” bring the email to life, and reinforce the fact that the guide has been designed by Finisterre to make its customers’ lives’ easier. The design: The striking (and on-brand) photography, as well as the clean, minimalistic template design, makes it difficult not to look twice (or three times) at this email. 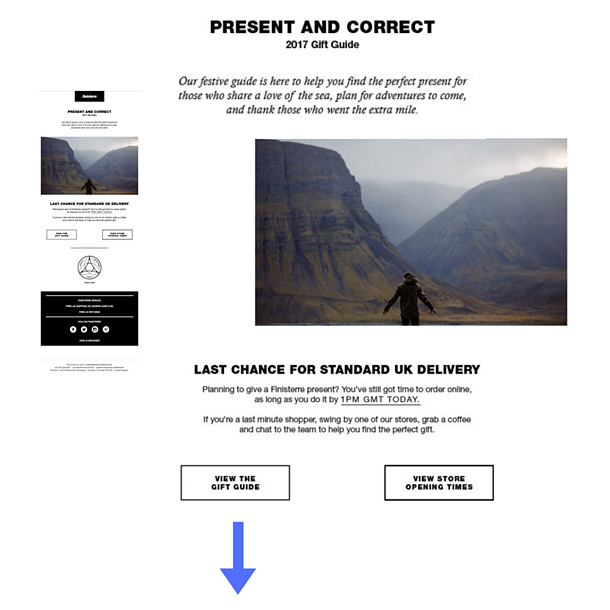 The message: Similar to the Finisterre example above, the gift guide promotion in this email ties in nicely with the other messages being communicated: to remind recipients of the 60% off sale and when they need to place their order by. The category recommendations: As Clarks doesn’t know much about the recipient of this email, it makes sense that the gift guide categories recommended are broad - “for her & for him” and “for the kids”. If you don’t know much about a recipient, it’s better to provide a wide range of information rather than just guessing what they’ll be interested in. That said, if you do have enough data to power more personalised, bespoke recommendations from your gift guide, this is always best practice in our book. 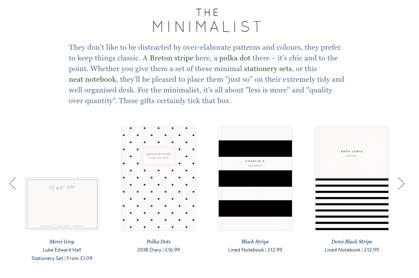 Rich in content: This email from Papier works so well because it’s bursting with an eclectic range of good quality, engaging content - including its gift guide. Straying for the usual catalogue style approach, Papier’s guide (once opened) looks and reads like a blog post, so it makes sense for its promotion to have a more subtle, editorial edge. 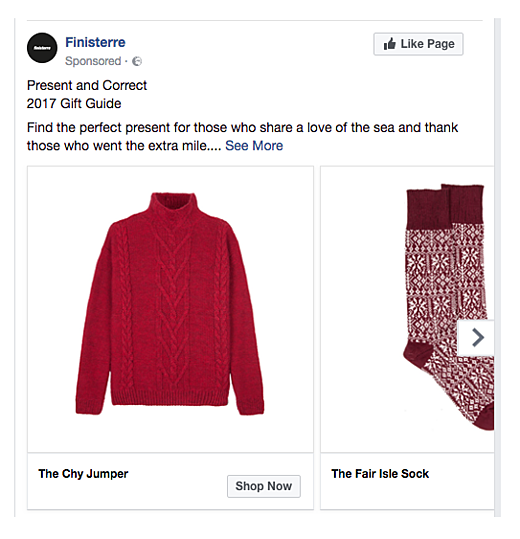 Adapted for social media: Showing some cross-channel craft, Finisterre also promotes its “present and correct” gift guide via sponsored ads on Facebook. As you can see, the copy is a lot more succinct than the descriptive writing found in the email, and is therefore more likely to engage a consumer scrolling speedily through their feed. 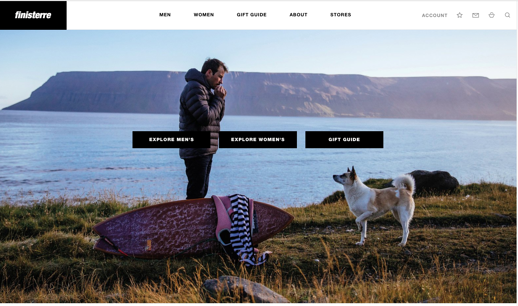 Personalised approach: For this promotion, Finisterre is a bit more targeted in its approach - suggesting specific products to the consumer in question, instead of a more generic promo of the gift guide as a whole. 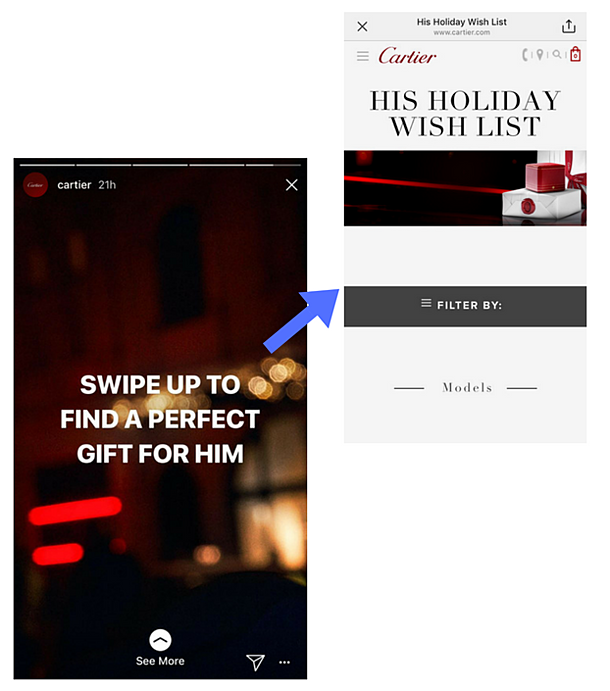 Format: Cartier uses the Instagram Story format to quite literally tell a story, finishing off with the clear as day CTA “swipe up to find a perfect gift for him”. This page then redirects to gifts for men. Interactive: Instagram Stories work so well for retailers because they are: (a) so easy to interact with and (b) fun to watch. Requiring a click here and a swipe there, Stories can successfully get followers more involved in your marketing strategy, and enable you (as a marketer) to speak with them in a less formal and more friendly way. 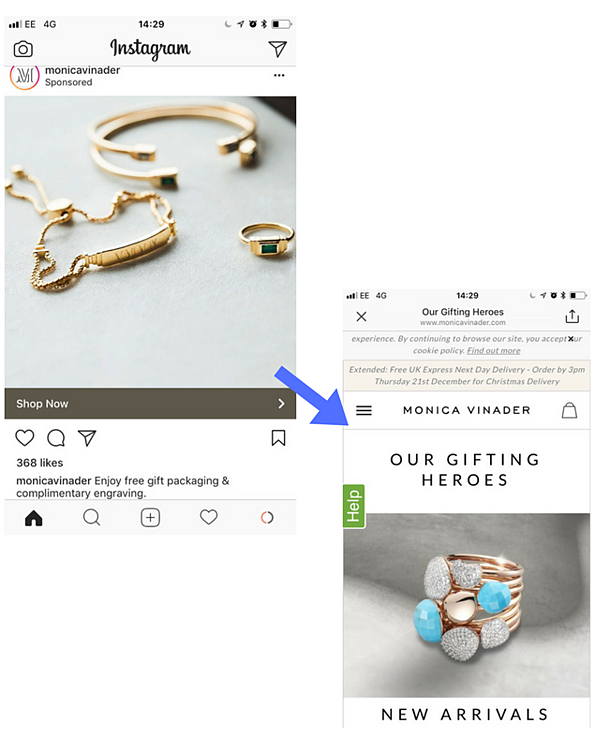 Targeted: This sponsored ad from Monica Vinader popped up on our Instagram feed recently, giving us (as jewellery lovers) plenty of gift inspiration. As our account regularly engages with posts of beautiful jewellery and accessories, it makes total sense that we were targeted with this ad. Imagery: The photo included in the ad is not just eye-catching, but also perfect for the purpose of the ad, which is to promote its products and services. Caption: The caption is short and sweet, capturing the most important information in one sentence. CTA: The CTA “Shop Now” works here because the brand is specifically talking about free gift packaging and complimentary engraving, however, if the post was published earlier on this season when shoppers were just starting to think about gifts, a “Learn More” CTA could also have worked well here. Organic: Promoting your gift guide on social media doesn’t have to come at a cost. We quickly discovered this post from Zara Home by simply searching for the hashtag “giftguide”. Format: Whether it's video or carousel, using different formats for your social media posts (paid or organic) is a simple way to grab a follower’s attention and make your feed feel more dynamic. 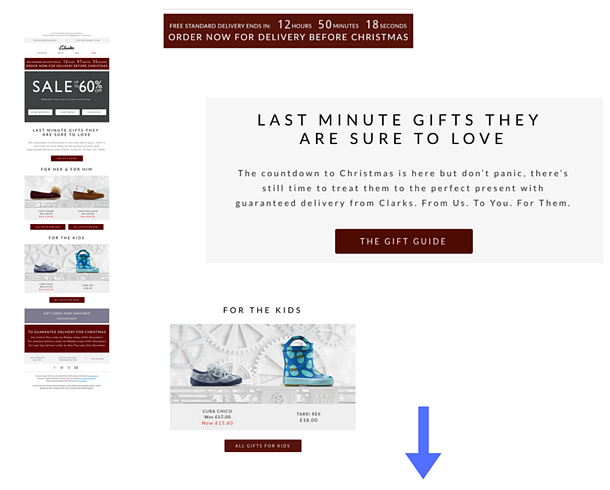 Visible: Positioned at the top of the homepage, this gift-guide banner is impossible to miss. Niche: The nature of this particular promotion is very specific: it’s for those after “fashion gifts”. This is likely to resonate with visitors to the Topshop site, who are likely to be fashion conscious. Products on display: The promotion makes the most of the space available to display example products without the banner looking to squashed. 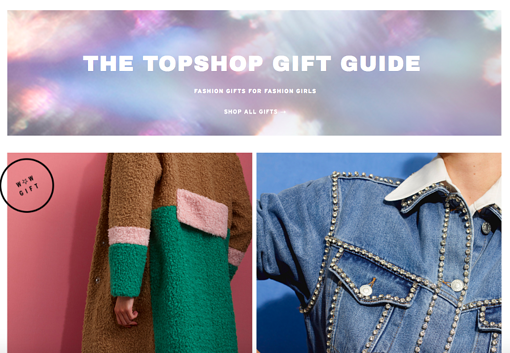 Slideshow format: Topshop also makes the most of the space available by including multiple slides within this banner - each promoting different aspects of the gift guide, or even something different entirely. UX: Over the last couple of years, Matches Fashion has become known for its commitment to shoppable video - so it’s no surprise the “gifts” section of its website is introduced by a cool video inviting visitors to watch and click on any products they like the look of. Once clicked, the visitor is taken to the right product page. The whole experience is at once fun and genuinely helpful. 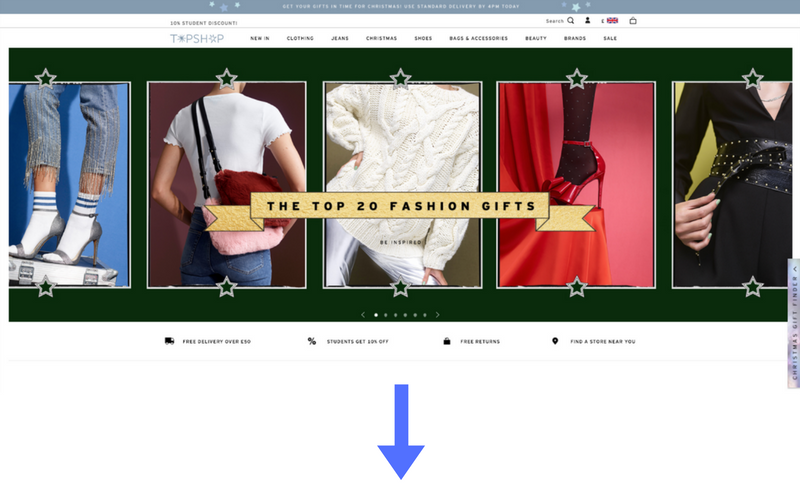 CTA: Whilst the video enables visitors to shop specific products throughout, it also features a static CTA for viewers to “Discover the gift guide” as a whole. Most of the examples in this post are targeted but not super-personalised. If you do have enough data about your customer, you can experiment with personalisation to promote aspects of your gift guide to specific recipients. For example, if you’re a bookstore, targeting a gift guide of recommended reading for teenagers to a shopper that has bought children’s fiction with you for the past [X] years. That said, when it comes to gift guides, it’s wise not to assume you know too much, as shoppers are likely to deviate from their normal patterns around this time of year and purchase for friends, family or colleagues they’ve never bought for before. It’s for this reason we suggest accompanying any super targeted messages about specific parts of your edition with a more generic plug for the gift guide as a whole.